I mentioned a couple of days ago that I'd signed up for Shimelle's online class 'Something From Almost Nothing'. The class focuses on getting more from the stash we already have. 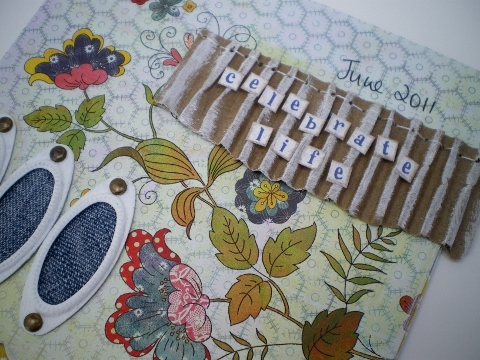 There's lots of tips, prompts and tutorials that help build an album entitled Celebrate Life. In lesson 1 you create the album cover - and here it is. 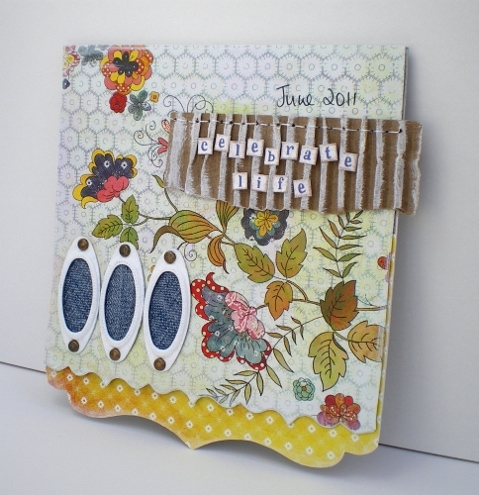 This week's City Crafter Challenge 'Back To Basics' to use paint and recycled cardboard was perfect for this project. 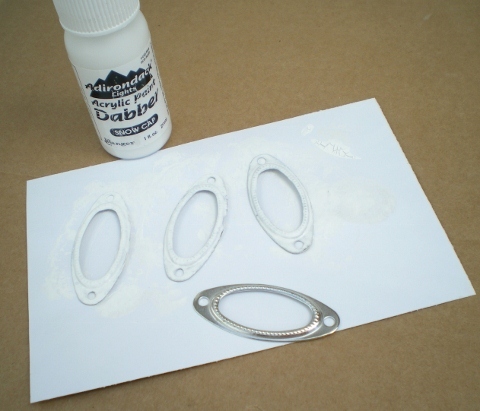 I used white acrylic paint on the cardboard and metal oval frames. This is one beautiful card! Gorgeous background papers, and the little letter tiles are so cute. Your cover looks gorgeous Vicky. What a great idea to paint the frames...a tip to jot down and remember me thinks! such a cool idea, the painted metal looks great! Love this cover Vicky you've done a great job with all the different elements. PS congrats on the win too - I'm just catching up. Stunning! Love the colours you've used and what a fabulous idea to paint the frames...another lovely piece of work, Vicky! That is such a wonderful creation, great use of stuff from your stash and cardboard, thanks for playing along with us at CCCB! Totally beautiful ... what a lovely cover for your album and I love the painted frames ... thank you so much for playing along at CCCB ... I can see your album is going to be spectacular! I just love the design of this.. The DP you picked out looks wonderful. Thanks so much for playing along with us at CCCB! tHIS is WONDERFUL! i WOULD NEED TO HAVE IT OVER MY DESK TO CHEER ME EVERY DAY! This is soooooooo pretty! LOVE it!